Our customer had moved into a new home in recent months. Her new garden had started to grow and the newly installed retic system was simply wrong…. Didn’t they think the plants would grow? LOL. 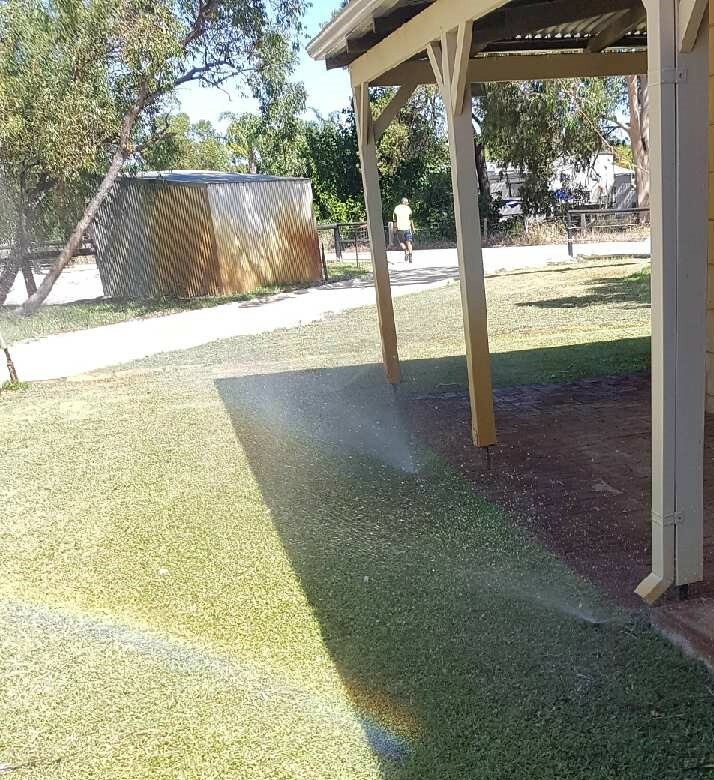 There was a row of popup sprinklers along the footpath facing uphill into a HEDGE, meant to water the entire garden right up to the house but she had to water by hand. Ridiculous. A quick fix would be to install 3 or 4 tall risers in the middle of the garden with 360 degree spray heads but they can be a bit of an eyesore. So I capped all those off under ground and installed a new grid running through the garden with poly pipe and spectrum stakes, adjustable to wherever they are needed and whatever diameter spray is needed. The other gardens had a similar system but not enough sprinkler coverage so added more. 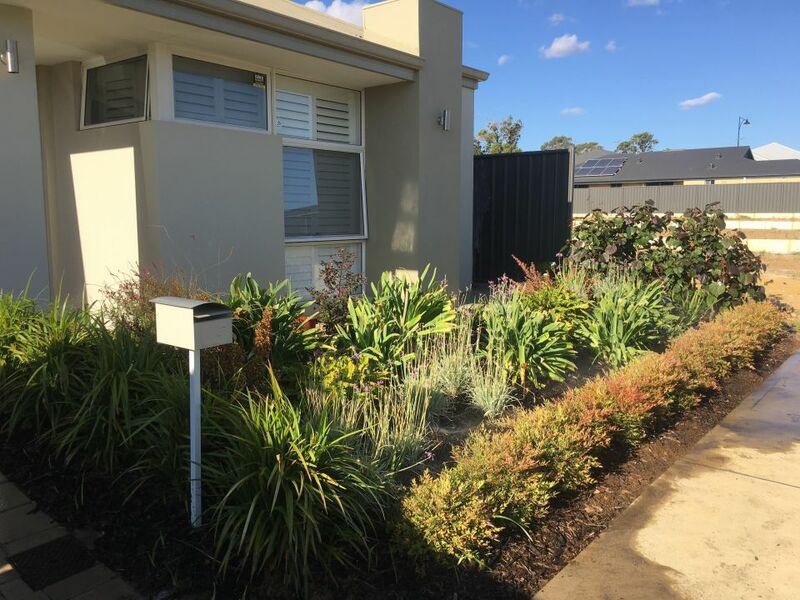 For all reticulation, bore, gardening and security alarms in ALL PERTH AREAS contact us! 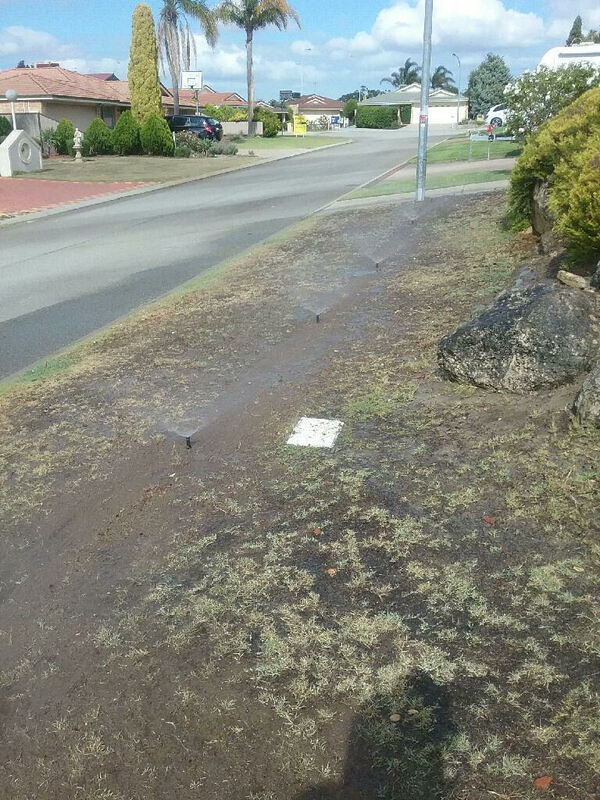 Basically our customer was sick of sprinklers being run over on his verge resulting in broken popups caused by vehicles. There are two easy modification solutions — 1) Install concrete sprinkler surrounds and 2) MOVE the sprinklers! (as per pic) Usually they go with option 1 but the guy chose to have them moved back from the verge. Could do both for a few dollars more each. His bore system was checked over and should run well without issues for some time. For all Retic, Bore Pumps, Garden Maintenance, Security Alarms contact PCG! The pic taken from a plane, halfway through the job! We maintain these commercial gardens and several others North of the River. We recommend to mulch your gardens once per year to retain moisture in the soil. This saves water and feeds your plants. 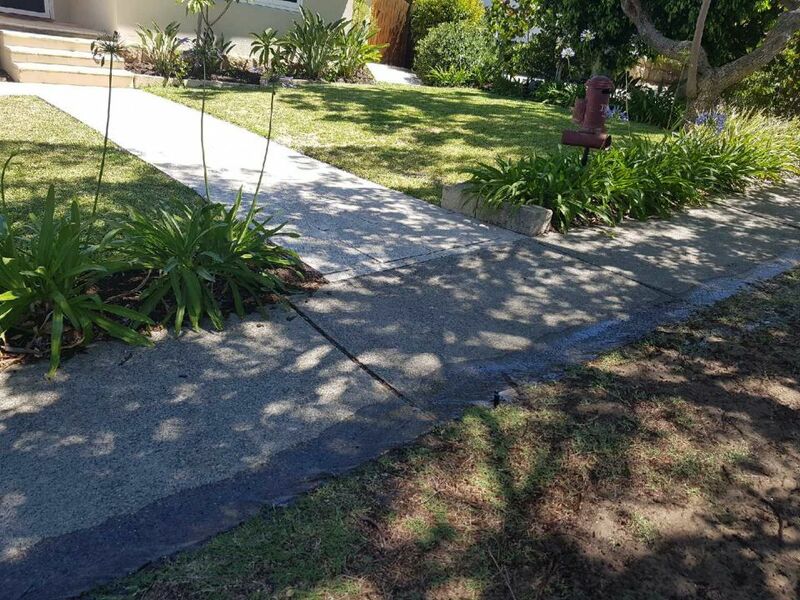 We can do Jarrah, Marri, Pine bark or a budget black or fresh chipped tree mulch which work really well but may not look quite as appealing. In this job we do Marri chips. We also recommend native W.A plants. Contact us for all your garden maintenance, reticulation and home security alarm needs! A submersible bore system low on pressure. The bore pump seemed fine (we repair these) The issues were numerous: Many popup sprinklers old and leaking and two underground pipes leaking. One was caused by large tree roots growing along the pipe, bending it till it broke the join. We cut away some and diverted around the main root and replaced the sprinkler and most of the others. The controller was set to 3 days per week. Bore systems are allowed 3 days and mains systems only two. 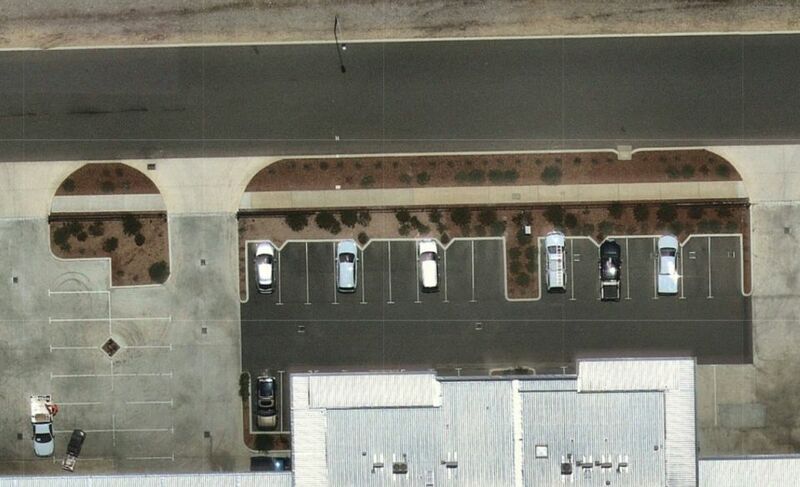 MENTION THIS PAGE FOR $50 OFF YOUR ROCKINGHAM AREA RETICULATION SERVICE !!!!! A very common issue we get all the time and are very good at – Finding and Repair of a retic station. It is usually a solenoid valve’s solenoid or a wiring issue. Sometimes it is the diaphragm or a rusted stem. We recommend quarterly maintenance to avoid urgent call outs. Contact us for all your reticulation and home security needs! A large 4 acre property required maintenance on all stations. We replaced all the sprinkler heads, located and replaced leaking solenoids and made sure all popups were covering all lawn and garden areas. Station 1 was not coming on so we found and fixed the valve for that area with our special equipment! Please contact us for Retic repair / installs and Home Security installations. Please note we now also do Security Alarm and CCTV camera Installations so register your interest for a free consultation! Another reticulation system requiring a lot of work, almost a whole new system. 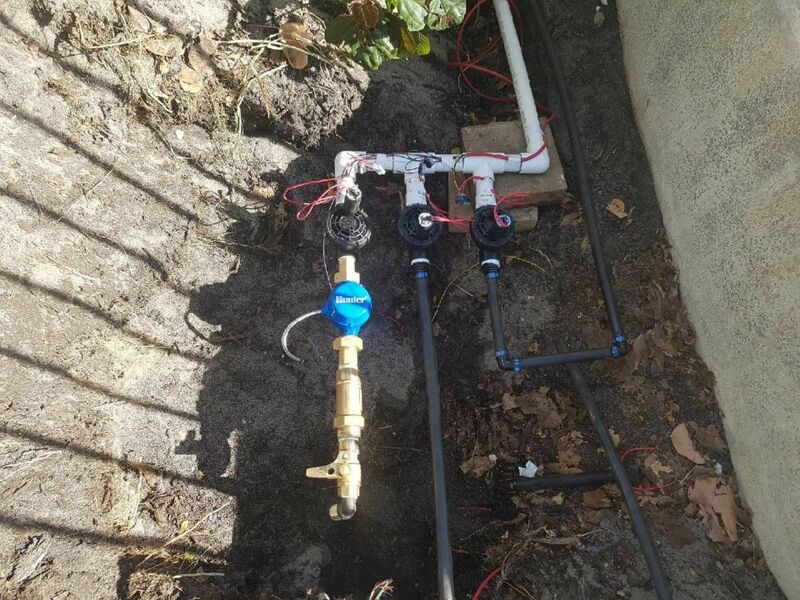 The solenoid valves were shot, the mainline was old poly pipe with splits and breaks through rose gardens and the control box needed replacing! We installed a State-of-the art Wireless Hunter Pro-HC Wifi controller to automate the retic. (We have a good deal on these right now so grab yourself a bargain) We ran new waterproof cable across the house to new solenoids. Replaced the old poly mainline with 25mm PVC pressure pipe made in Australia. 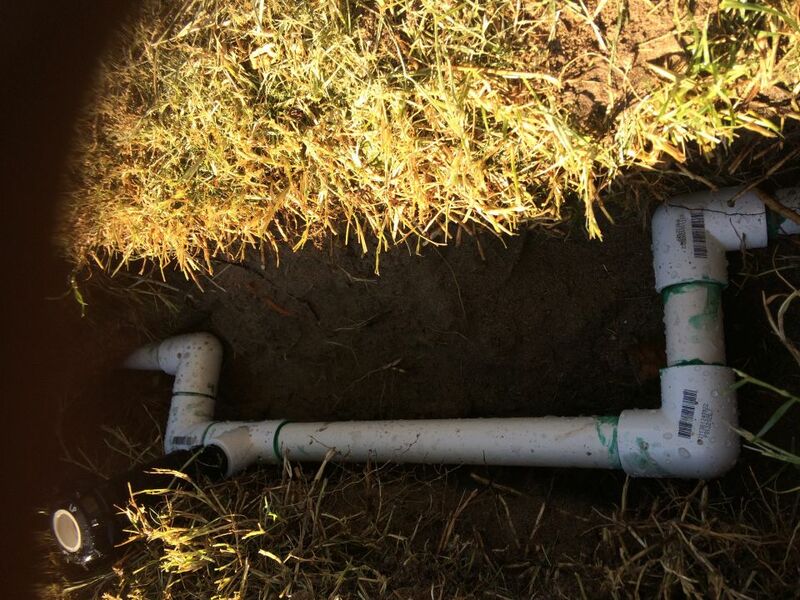 We are returning to do the sprinkler repair work which is always last as it is downstream. Same with our reticulation installations. Possibly the largest furniture store in Perth, Dankz Furniture, (very fine collection on sale) had us out to do some retic repairs. After clicking through the stations and walking around, a big day’s work was apparent. Every single commercial gear drive pop-up sprinkler had issues. After trying to clean and adjust the K-Rain ones which proved impossible (because of how old and un-maintained they were – the brand is OK), it was decided to replace them all. We had to cut away tree roots wrapped around some with a reciprocating saw and others were jammed under gravel and concrete edges. The sprinkler we installed were Hunter PGP. They have a rubber seal preventing debris. We also lowered some which appeared the previous popups were a bit high for the lawn mower. We installed concrete surrounds on several, as semi-trailer trucks had been parking right on top of them causing issues with the owners. Hopefully we have prevented that! And plastic ones around the rest. We then spent a few hours replacing the ones next door, the property also owned by them. GREEN LAWNS ON THE WAY! The Real Estate sent a job order for “System not working correctly” Quite vague, though, usually our vehicles are equipped to handle anything on the first visit. There was water spouting out of the front lawn everywhere and loked like a huge job. But all it needed was all new popup sprinklers. They were worn out or broken off. Broken off by lawn mowers and kids on bicycles. I installed new Toro popups but at a lower height than before to prevent this in future. The back yard was similar, except full of chickens and Rabbits. lol. Programming was wrong so I fixed that to water corps rules. A total system overhaul in good time, just 3 hours. Contact us for Reticulation repairs and installations, Security installations, Maintenance on systems and gardening. Check out our new wireless retic. 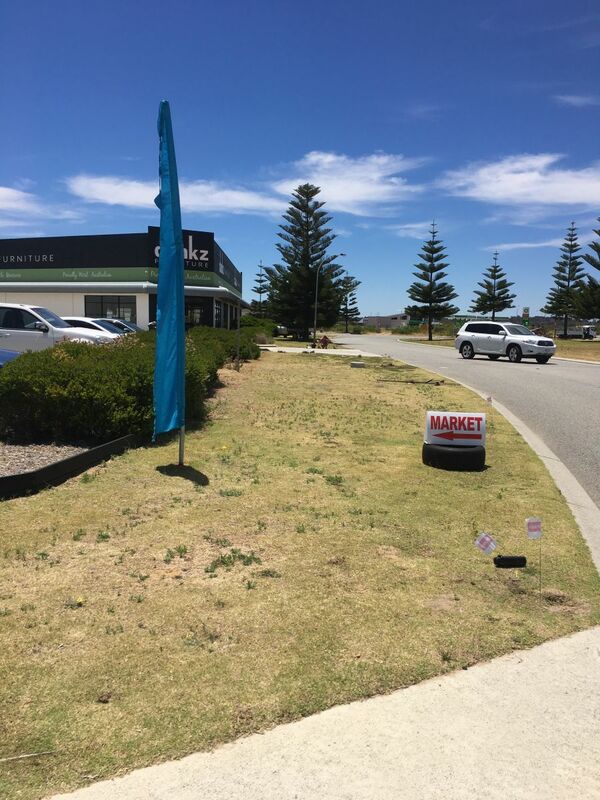 We cover the Rockingham area, Perth City, to Yanchep area across to the Perth Hills! 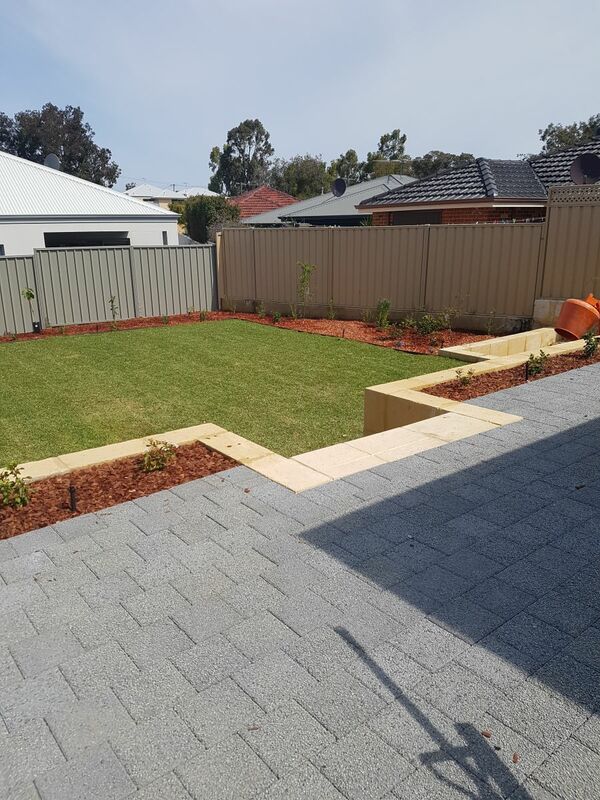 PCG has been busy working on a full property landscaping project consisting of paving, limestone retaining wall and stairs, Roll on Lawn & a complete automated reticulation sprinkler system, Garden beds and plants. It is the largest project PCG has taken on to date, converting front and back yards from sand and weeds to fully landscaped. We’re so thankful to Jess for giving PCG the amazing opportunity to turn her house into her dream home! See the photos for the absolute beautiful transformation the team has accomplished!